The mission of Volunteers in Philanthropy (VIP) is to improve the quality of life for Berwick area residents. The goals are enriching volunteerism and making meaningful grant investments. 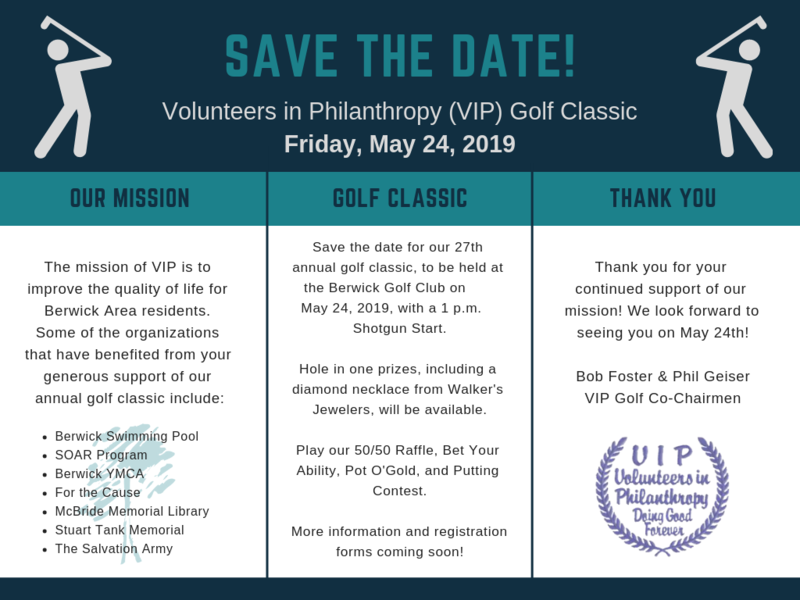 During the past several years, VIP members have participated in the following Berwick and surrounding area activities: Relay for Life, Christmas Parade, Foundation mailings, Berwick Retirement Village, Elmcroft, and Bonham Nursing Home. Poinsettia plants were also delivered to Berwick Hospital Center patients as well as Christmas Stockings for the Holiday Newborn babies. Interested in sponsoring a hole? Learn more here. Join us on May 24th! Fill out the golfer form to register.